'Attitudinal change' in the context of economic reforms has been referred to in Rodrik and Subramanian (2005), DeLong (2003), Kohli (1989), and Panagariya (2004, 2008). This dissertation provides empirical support for this literature, establishing an earlier start for India's economic policy liberalisation than presented in stylized accounts. It demonstrates the endogenous nature of the origins of these policy shifts. 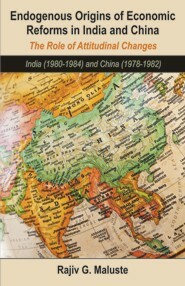 'Attitudinal change' literature had directed attention to the need for further research into India's policy changes of the early 1980s and for studying broader comparability issues in other developing countries. This research makes a contribution towards filling these gaps. This dissertation shows that India started its economic liberalisation under the Indira Gandhi administration from 1980 to 1984. These findings depart from the conventional view that India's economic policy changes were initiated by the Narasimha Rao government in 1991, or by the Rajiv Gandhi administration in the mid to late 1980s. The dissertation establishes that policy shifts of the early 1980s had endogenous origins in the political leadership's attitudinal changes. The Indira Gandhi administration of the early 1980s revisited the statist policies of its previous tenure from 1966 to 1977. The new approach entailed more openness towards private enterprise, scaling back the role of the public sector, and starting India's integration into the global economy. The dissertation also discusses the comparable role of attitudinal changes at the start of China’s policy liberalisation led by Deng Xiaoping from 1978 to 1982. It focuses on the significance and challenges faced by China’s political leadership in bringing about societal attitudinal change. The dissertation concludes by drawing comparisons between India and China, developing a linkage between their endogenous attitudinal changes and economic policy liberalisation. Rajiv G. Maluste has a doctorate in Economic History from the London School of Economics and Political Science. He has a Masters in Public Policy from Princeton University's Woodrow Wilson School of Public and International Affairs. Rajiv's research interests include public policy, political economy, economic history and development, and the interplay between states and markets. His previous professional background has been in capital markets with Morgan Stanley in New York and London, and with the United States Department of the Treasury in Washington, D.C.